For many people, cold and flu have become an inseparable pair, like salt and pepper or New Year’s and weight loss. Walking down the “cold and flu” aisle of any drugstore, you will find stacks of bright boxes with bold claims of help for those suffering from a cold or the flu. Since the two illnesses share some similar symptoms, and both come during “cold and flu season,” the two often run together in people’s minds. We have a vague idea that they are different, but if pressed, have a hard time saying exactly how. The cold is much more common. The flu is much more serious. A single family of viruses – the influenza viruses – causes the flu. 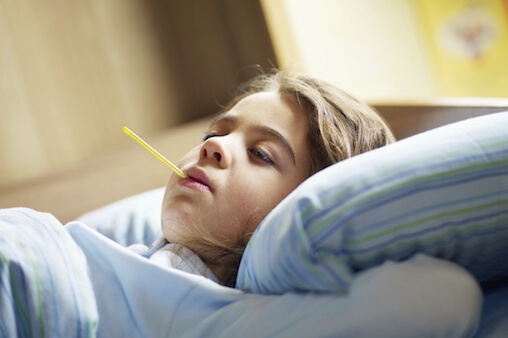 Unlike with the common cold, both adults and children with the flu generally have a fever and feel sick all over. For the great majority of people, the illness is quite unpleasant but not dangerous. However, the flu can be quite a serious illness. The most deadly recent worldwide outbreak was the flu epidemic at the beginning of the 20th century, which killed more than 20 million people. According to the Centers for Disease Control (CDC), from the 1976-1977 flu season to the 2006-2007 season, flu-associated deaths have ranged from about 3,000 to 49,000 people. During the recent H1N1 influenza pandemic in the 2009-2010 season, a total of 41,914 influenza-associated hospitalizations were reported to the CDC. A total of 2,125 deaths were reported to the CDC, including 279 pediatric deaths (four times the average reported over the preceding five seasons). The number of deaths is a small percentage of those who get the flu (much less than one percent). They are primarily those who are weak from advanced age or a major illness. Still, about one percent of otherwise healthy children get sick enough from the flu to be hospitalized. Most people get the flu once every year or two or three – unless they are vaccinated. It can happen at any age, but is most common among school-aged children. The flu is most common during the winter months. Classically, the flu begins abruptly, with a fever in the 102 to 106 degree range, a flushed face, body aches, and marked lack of energy. Some people have other systemic symptoms such as dizziness or vomiting. The fever usually lasts for a day or two, but can last five days. The most prominent of the respiratory symptoms is usually a dry, hacking cough. Most people also develop a sore (red) throat and a headache. Nasal discharge and sneezing are not uncommon. The initial symptoms of inhalational anthrax can be similar to those of the flu. The flu is very contagious. It can be spread by airborne, droplet, or contact transmission and by fomites. Inhaling droplets from coughs or sneezes is the most common way to catch the flu. Symptoms appear 1 to 7 days later (usually 2 to 3 days). Symptoms (except the cough) usually disappear within 4 to 7 days. Sometimes there is a second wave of fever at this time. The cough and tiredness usually lasts for weeks after the rest of the illness is over. The flu is airborne and quite contagious, and with its short incubation period, it often slams into a community all at once, creating a noticeable cluster of school and work absences. Within 2 or 3 weeks of its arrival, most of the classroom has had it. The diagnosis is often based on the history and physical examination. Viral studies on nasal or throat swabs obtained during the first 72 hours of symptoms can verify the diagnosis if there is a question. Blood tests can make the diagnosis after the fact. The initial symptoms of inhalational anthrax can be difficult to distinguish from the flu. Specific antiviral medications are available, and recommended for those with severe illness, those at high risk for complications, and children with social situations that would make treatment benefits outweigh the risks. If specific treatment is to be used, it should be started as early in the illness as possible. Rest, fluids, and fever control are useful for most children. Other treatments are aimed at reducing specific symptoms. Aspirin use in children with influenza increases the risk of Reye syndrome. People are most contagious beginning 24 hours before they develop symptoms (and up to 7 days afterwards), making it difficult to prevent the flu by avoiding sick individuals. The flu vaccine is a specific and effective way to prevent the flu. It is available for children over 6 months old. Children under 9 years old need two doses of the vaccine the first year they get it. Yearly flu vaccine is especially important for children with asthma, cystic fibrosis, bronchopulmonary dysplasia (BPD), heart disease, HIV, sickle cell anemia, juvenile rheumatoid arthritis, diabetes, and a number of other chronic childhood conditions.